Bring the stock to the boil in a large pan. Add the asparagus, cover and cook for approx. 7 mins. until just soft. Remove, keep warm. Set aside 150 ml of cooking liquid. Heat the oil in a non-stick frying pan, reduce the heat, fry the salmon fillets for approx. 2 mins. on each side, season and keep warm. Reduce the reserved cooking liquid and wine to approx. 150 ml, pour the reduction into a measuring cup. Place the balsamic, egg and egg yolk in a thin-sided bowl, suspend the bowl over a gently simmering bain-marie; the bowl must not touch the water. Mix well using the whisk on a hand mixer. Pour in the reduction a little at a time, whisking constantly until the mixture becomes foamy. Remove the bowl from the heat, briefly continue whisking, season. 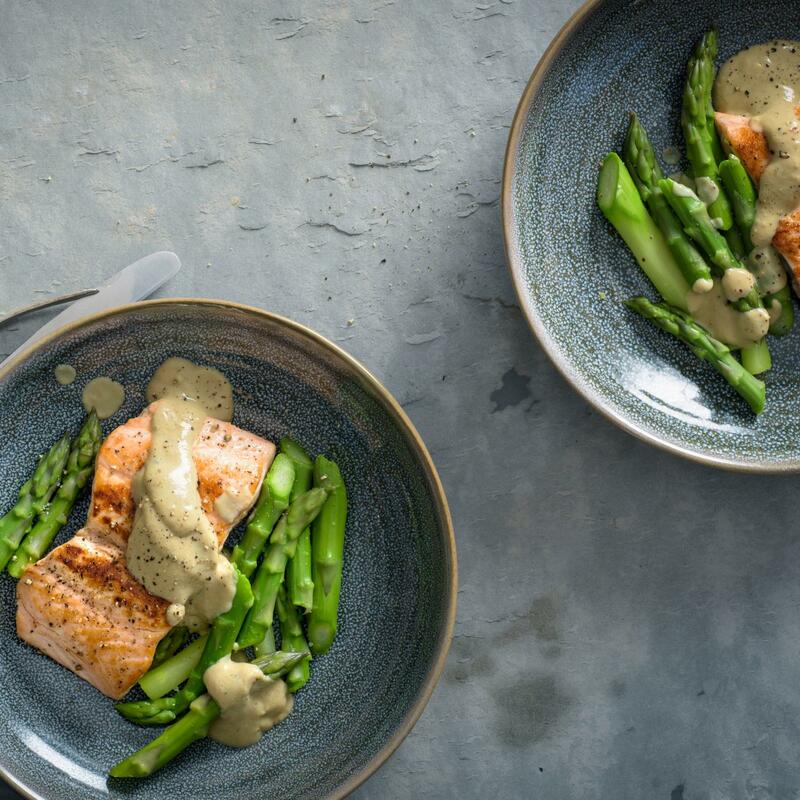 Plate up the asparagus and salmon, top with a little foam, serve the rest alongside.